So what are the best chef shoes? The answer is going to be entirely up to you. We’re here to help you find the chef shoe that is right for your workplace! We’ve done all of the research to bring you a huge selection of shoes that will work for your food service and kitchen environments. Before we get started, here are some things you should consider while purchasing chef shoes. Gender: Which gender are the shoes meant for? Men and women’s shoes have different sizes, so this only really affects the sizes that you’ll need to order the shoes in so they will fit you properly. Type: There are a few different types of shoes, including clogs, slip-ons, and even tie-on shoes. This will determine how the shoes fit and look, and your employer might prefer one style over another. Make sure you consider this. Color: What color is the shoe? For most food service shoes, black is the standard color and the one that your employer or workplace will most likely approve of. Sometimes they come in other colors as well! Size Range: What sizes do the shoes come in? These size ranges will be linked to the gender the shoe is made for, so a man’s size 8 is not the same as a women’s size 8. Slip Resistant: Slip-resistant shoes help you to stay on your feet if you happen to work in a particularly slick environment, whether from an accumulation of water or grease. This is essential for shoes in the food industry. Material: What are the shoes made of? Leather and synthetic leather seem to be the most popular options among shoemakers, and for good reason. They are comfortable and most are resistant to water damage and staining. Now let’s get to our top-rated chef shoes. We’ve chosen a healthy selection of different types of shoes, and shoes that can be worn for multiple purposes. Whatever you’re looking for, we are sure to have a shoe that will work for you. Check out our top pick and budget pick first, as these are our personal favorites. The rest of the list has some amazing shoes as well. Let’s get cooking! The best rated chef shoes on our list are these Boston Work Clogs from Birkenstock. 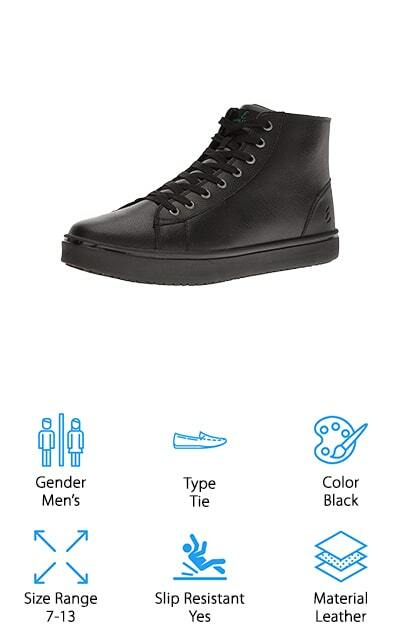 These are unisex shoes that sell a variety of sizes so that everyone can get their perfect fit. That’s important when you’re going to be on your feet most of the time. They are made of 100% leather that is non-staining and won’t absorb water, with a synthetic sole and a comfortable cork footbed. The cork is contoured to your foot and helps to support all of the arches and pressure points on your specific foot because it molds and shapes for a custom fit. These shoes are slip resistant and will keep you on your feet even under the slickest conditions. The 0.75-inch heel and 0.5-inch platform give you a great feel for the floor beneath you while still providing cushion and comfort. Everything about this shoe is genuinely geared towards comfort and function for your perfect cooking experience. When it comes to quality shoes, Skechers is one of the first brands that most people think of. They are an inexpensive brand that makes shoes that will last and look great while doing it! These cheap chef shoes are made of excellent-quality synthetic leather material with a mesh fabric upper and an outsole that is also synthetic. These are slip-resistant shoes with traction texturing on the immediate outsole for extra gripping, as well as side gores at the opening of the shoe that helps keep air circulating. Your feet will love getting that extra airflow when you’re on them all day. The lining is a soft fabric that is comfortable and breathable. These shoes even come with memory foam insoles to provide extra cushioning and a padded collar for comfort. All of the seams are reinforced so they won’t wear out any time soon. If you’re on a budget, check out these Mcallen Slip-On work shoes by Skechers. KEEN makes the best men’s chef shoes on our list with their Utility PTC work shoe. These slip-on shoes are made of 100% genuine leather with a high-quality non-slip rubber sole. The upper is completely water and stain resistant, while the sole is slip- and oil-resistant. You’ll always stay on your feet with these shoes on! They also include the protection, which means that the outsole comes up over the toes so you get the most comfort and protection from this shoe than most others in its class. The footbed is made of cork, recycled PU, and memory foam that work together to give you the proper cushion and make your work day a breeze. Plus, the midsole is made of compression-molded EVA foam for comfort. There is also an elastic gore panel at the opening of the shoe that helps airflow and breathability. These are amazingly high-quality chef shoes with everything you could want! 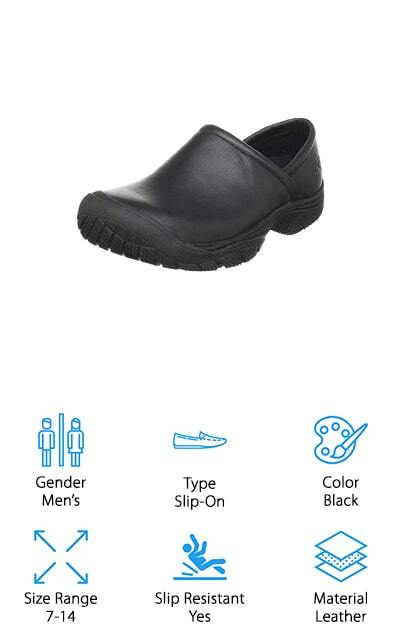 Crocs on the Clock is a new line of shoes from Crocs that tackles work shoes for different situations. This chef shoe is a slip-on unisex shoe that comes in sizes ranging from 9 to 15. They are made of man-made materials with a synthetic sole, but that’s not all that these crocs have to offer. 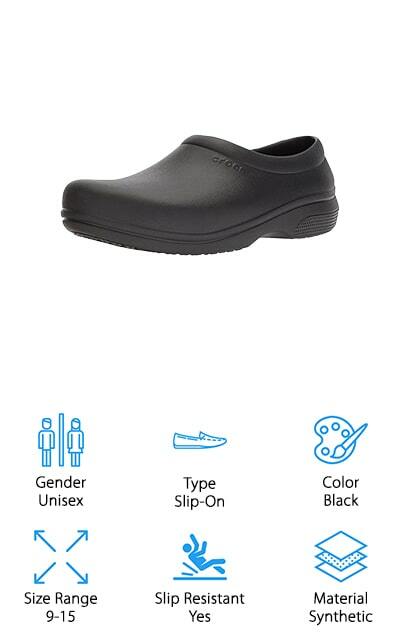 They have an enclosed toe and heel to make sure you’re keeping up with workplace standards, as well as slip-resistant treat and greater arch support than other Crocs in the past. These shoes have a comfortable, relaxed fit that tapers back towards your heel so that they fit securely. These are some of the best women’s chef shoes on the market right now, and men can get them too! The footbeds are contoured and molded, while the liners are moisture-wicking so that you can eliminate any sweat you accumulate during the day. If you’re going to be on your feet all day, be comfortable! Popular chef Emeril Lagasse, of course, knows what makes or breaks a chef shoe. He’s made his own brand of shoe to bring his expertise to the table! These 100% leather shoes have a rubber sole that is slip resistant on wet and greasy surfaces. The midsole is molded EVA foam for comfort and support, with a memory foam insole that gives you comfort no matter how long you’ve been standing on your feet. While these aren’t high top chef shoes, they do cover your ankle fairly well so that you can comply with all of your workplace guidelines while you’re on the clock. The breathable lining on the inside of the shoe is odor-resistant and breathable, giving you peace of mind while you’re running around on your feet all day. They stay fresh for longer. Every feature of this shoe is intuitive because it’s developed by an actual chef with experience in what works. 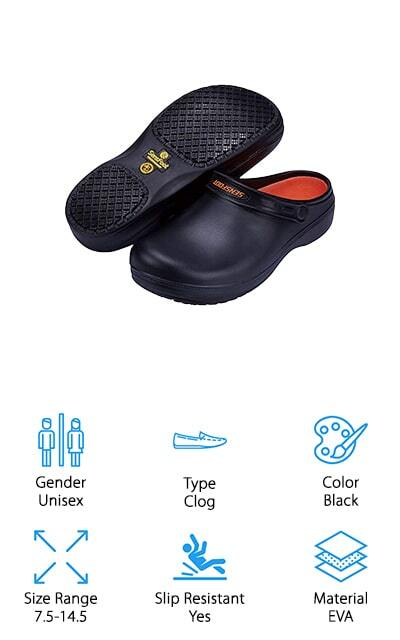 These Klogs Edge Chef Clog shoes are made entirely with flexible polyurethane for both the sole and the upper. They are slip-resistant, oil-resistant, and the outsole even absorbs shock so that your feet will feel much better after walking around all day. The insole is removable and works as an odor-resistant, latex-free liner that is also antimicrobial. Because of the way that these clogs work, these are the best chef shoes for flat feet. They are clogs that don’t mold to arches, so people with flat feet will feel a little more comfortable. The tip has a generous fit for more widespread toes, with a length that fits perfectly according to your shoe size. The company asks that you order a half-size larger if you are in between sizes to get the most comfortable fit for you. 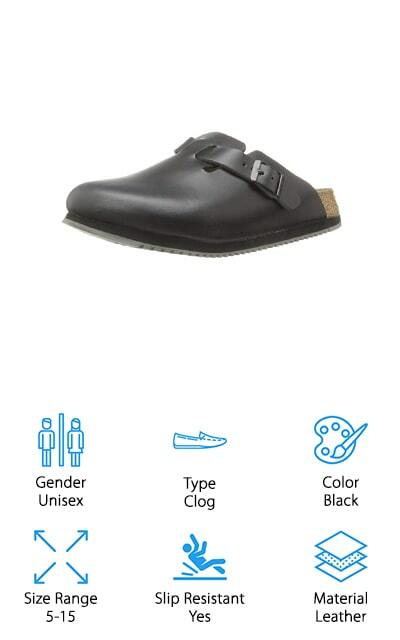 These black men’s clogs come in sizes ranging from 7 to 13 so there’s enough choice for everyone! MOZO makes these Shark Work slip-ons with synthetic soles and water-resistant, synthetic polyurethane uppers. They won’t stain and do their best to keep your feet dry. The sole is made of synthetic material has slip-resistant traction technology to keep you on your feet even when you’re working in a slick environment. This traction system is widely used by the Shoes For Crews program that some food service companies use to purchase their employees’ shoes. There is elastic goring on the sides so that the shoe stays in place. It increases airflow and makes it easier to slip the shoe onto your foot. MOZO has something called the MozoFit System, which allows you to get the perfect fit out of your shoes when you order. We really like the Sharks Work Slip-On work shoes, and they are definitely perfect for chefs and other food service employees. You should give them a try today: you might find your new favorite shoes. The best chef shoes made of EVA on our list come from SensFoot. 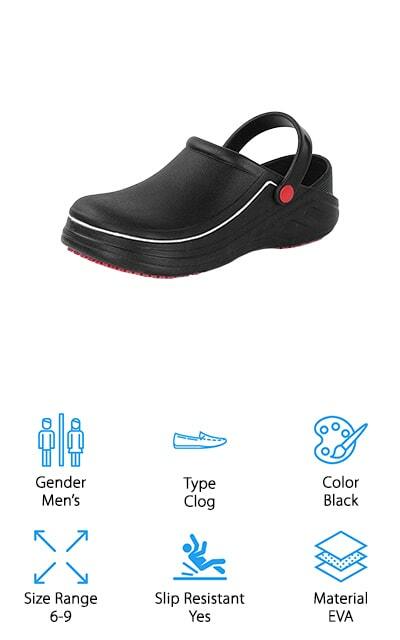 These clog-style shoes boast an EVA upper and molded midsole, as well as a rubber sole that is slip-resistant on oil and water. It’s great for people who work in the healthcare or service industries. EVA foam allows these shoes to be incredibly lightweight, which is great if you’re going to be on your feet all day anyway. In sizes from 7.5 to 14.5 in unisex varieties, there’s something for everyone! These shoes are also environmentally friendly, so you can purchase them with that peace of mind. In addition, these shoes were designed by people who know what it’s like to work on your feet all day, so you know that you’re getting the best quality and comfort for the price. When you need a comfortable black clog shoe that’s going to be comfortable and lightweight, go with these black chef clogs by SensFoot. 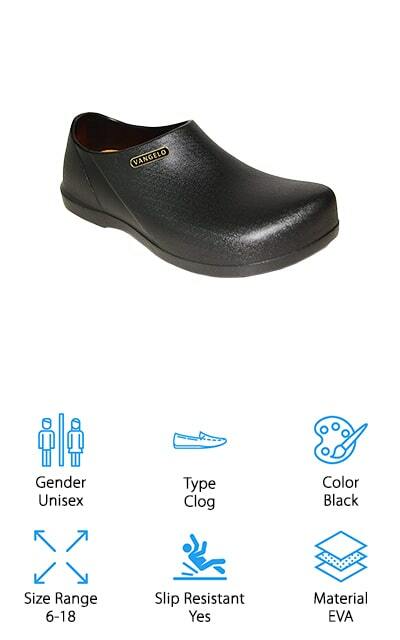 VANGELO makes these slip-resistant EVA clogs that you can wear all day long at your restaurant! These slip-resistant clogs are made to the industry standard and endorsed by chefs in the White House. That means that these are some amazing shoes! The EVA foam body is so lightweight that you won’t feel like there’s anything on your feet at all. The outside sole is shaped in such a way that it works to channel fluids away, meaning that they won’t create a barrier between your shoe and the floor. You’ll get more traction this way and stay on your feet. They come in men and women’s sizes so you can get the perfect fit, and they are washable on the inside and outside to keep them looking and feeling great. The removable Ortholite insoles are supportive and comfortable even after wearing them all day long! You’re going to love these shoes for food service or healthcare. Fanture makes some of the best chef shoes that we could find. These shoes are specifically for men for use in food service positions, hospital or clinics, or any other position that requires you to spend long hours on your feet. They have a slip-resistant sole so they don’t slide around on a polished floor or in a slick kitchen. The insole is a non-slip, comfort insole that is breathable and will keep your feet dry and comfortable. The enclosed toe cap is sturdy and gives you much better protection against drops and spills than regular toe areas. You can use these shoes anywhere – from camping to the beach, walking around in your home or garden, or even hiking and hunting. They are truly multi-purpose shoes that the chef in your life will greatly enjoy. These are black and come in men’s sizes 6-9 currently, so check them out! They are extremely lightweight as well.